The current controversy surrounding the granting of permission for a 103-turbine wind farm on Shetland and a 67-turbine wind farm at Stronelairg in the Monadhliath Mountains is another alarming indication that democracy has no place in the Scottish Government under the SNP. 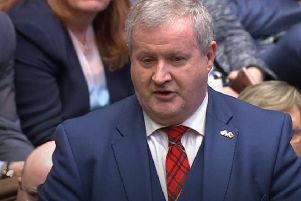 [Former first minister] Alex Salmond and [Energy Minister] Fergus Ewing and will go down in history as the men responsible for the destruction of the land and seascapes of this country, much against the wishes of a majority of the people and in the case of Stronelairg, Scottish Natural Heritage, its own agency. For what benefit? Certainly none so far as climate change is concerned. Whatever reduction in greenhouse gases may be achieved by destroying our land and seascapes will be offset many times more by the commissioning of new coal-fired power stations in China. Add to this the fact that The John Muir Trust has stated that the Stronelairg development will be self-defeating since it will destroy peat land, which keeps carbon locked in the ground. A look at the map of Scotland showing existing and proposed wind farms makes a depressing sight. If even a fraction of the outstanding applications are granted, it will be almost impossible to have a view which is not interrupted by a wind turbine, especially in the Southern Uplands/Borders. There can only be one reason; money and lots of it, for relatively few people and certainly not the electricity consumer and taxpayer who are paying hefty sums to provide the subsidies which are the main incentive to build these blots on the land and seascapes. IN RESPECT of comments made, Ms Wait (Letters, 14 February) perhaps needs to look and hopefully absorb, the plethora of evidence now available for anyone to examine on mortality attached to wind turbines and avifauna, not only birds. They really are too numerous to list here. To seriously suggest turbines as providing safe “perching” opportunities beggars belief and merely exposes a woeful ignorance of the subject. We currently have a big problem with the lack of adequate and (most importantly) independent monitoring of the UK wind farms for wildlife fatalities. That which is undertaken is often sporadic, developer-led, and nowhere near often enough. From overseas we have reports of deliberate burying of evidence. Whether that is happening here is clearly in the realms of guesswork. The immediate areas in a radius below the turbine blades soon become known to “Natures’ sanitation squad” and remains therefore become an unfortunately predictable/regular source of food. We may only know the true scale of casualties from future surveys revealing impacts on populations of species at risk. Added to this, if developers’ environmental statements are examined, the number of projected golden eagle, and other protected species’ fatalities are often clearly documented in applicable applications. The number actually being killed are rising, and will rise as numbers of turbines increase. This does not sit well with the opinion published.